Reigning Australian V8 Ute Series winner David Sieders has returned to the category in style, topping practice for Round 3 of the series at Queensland Raceway today. The arrangement for Sieders to compete in this weekend’s event only came to fruition at the last minute, the Sydney driver explaining he completed the deal earlier in the week. “Originally Craig Dontas was supposed to be driving but then he had to withdraw, so his ute became available,” Sieders explained. “It occurred to me that I hadn’t raced with the #1 on the door, which is something I really wanted to do. I arranged some things and was able to get myself onto the track. 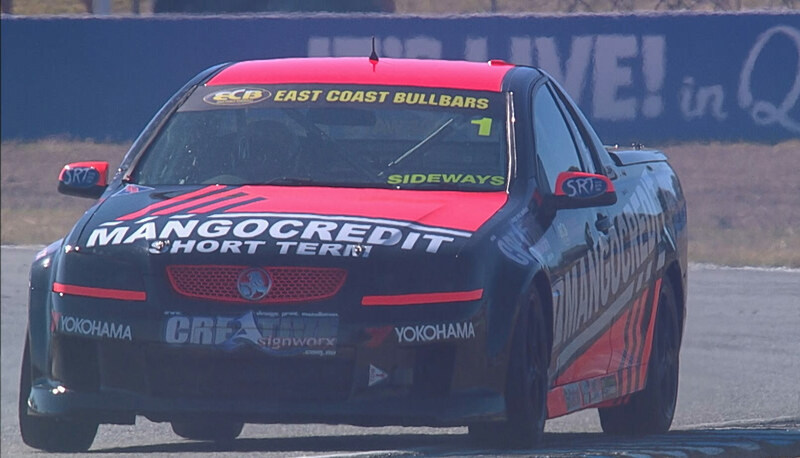 Bundaberg driver Mason Barbera was second fastest overall ahead of Ryal Harris. “The times are very close and it’s going to be competitive between the front-runners this weekend,” Barbera said. Craig Woods was fourth ahead of Marcus Zukanovic, while points leader Kim Jane was sixth. Both practice sessions ran without interruption, although rookie Christopher Formosa had two separate off-track excursions, at turns four and six. “I wanted to understand where the limits were so I knew how hard I could push in qualifying – I certainly know now!” Formosa said. This weekend marks the first time the V8 Utes have raced at Queensland Raceway since 2008. In the six appearances for the category at the venue, Holden has ruled qualifying having claimed all six pole positions. The General holds a clear advantage in the races as well, with 11 victories to Ford’s seven, and four round wins to Ford’s two. The most successful Ute drivers at Queensland Raceway are Gary Baxter and James Brock, each with three race wins. Qualifying and Race 1 for the Utes will be held tomorrow, with Races 2 and 3 taking place on Sunday.